Yoga Journal presents a six-week course, based on our Mindful Yoga Therapy program, that aims to relieve stress and anxiety while focusing on breath, movement, meditation, and yoga nidra. A portion of your purchase supports Give Back Yoga in bringing yoga and mindfulness to underserved and under-resourced segments of the community. Use promo code GIVEBACK100 for $100 off registration! Registration information below. Feeling overwhelmed, on edge, or panicky? Yoga can be a powerful tool for easing these and other symptoms of anxiety, stress, and trauma. Now, you can discover the powerful grounding techniques developed through our Mindful Yoga Therapy program, in the privacy of your own practice space. The six-week Yoga for Stress and Anxiety course will introduce you to a suite of techniques that can help you find calm and peace, including breath (pranayama), movement (asana), meditation, and yoga nidra (yogic sleep) techniques that can help you heal. These effective, embodied practices, shared by Mindful Yoga Therapy creators Suzanne Manafort and Robin Gilmartin, were originally designed to help veterans of war overcome trauma. The practices provide a feeling of groundedness and security, deliver relief from the symptoms of stress, and offer supportive skills to enhance everyday life now and long into the future. Sneak preview: try a Mindful Yoga Therapy sequence to train your brain to relax. 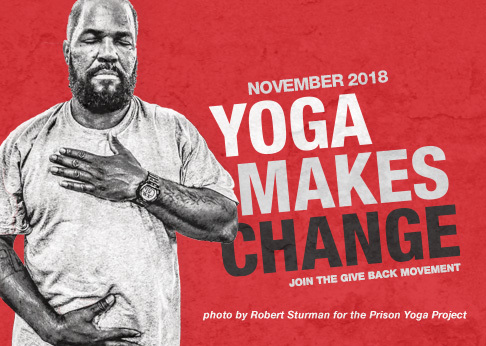 A portion of the proceeds of every course registration will support the Give Back Yoga Foundation in bringing yoga and mindfulness to underserved and under-resourced segments of the community. This is an online course, offered through AIM Healthy U and available “on demand.” You can access the course immediately after purchase. $249 | Use promo code GIVEBACK100 for $100 off!